Nigeria's reptile diversity includes several endemic species as well as a few very poisonous snakes. The black-necked spitting cobra is a poisonous snake indigenous to Nigeria. Nigeria’s reptile diversity includes several endemic species as well as a few very poisonous snakes. Nigeria is a vast country and its various habitats, from rainforest, mangroves, savanna, and woodlands, to plains and plateaus, are inhabited by numerous reptile species. Populations of lizards, snakes, and geckos roam various states in the country. The Carpet viper is an indigenous snake species in West Africa. This species is the most venomous of all the snakes roaming the region’s savannah. The snake grows to a length of between 12 to 20 inches, and it has characteristic of white markings on its body. Its diet includes rodents, large insects, and lizards. The females lay 6 to 20 eggs between February and March. By rubbing its serrated scales together, the snake produces a warning sound. The species is commonly sighted in the woodland and savannah, and it causes an estimated 20,000 deaths annually through hemorrhaging caused by its venom. The snake is under no major threats in Nigeria. 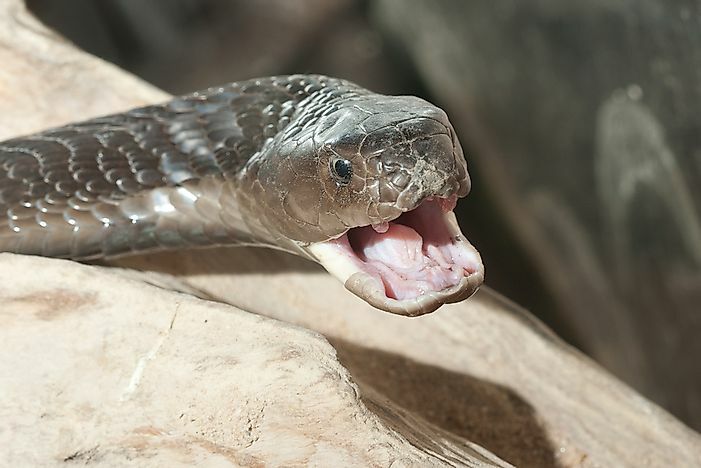 The black-necked spitting cobra is a spitting cobra species indigenous to Nigeria as well as other sub-Saharan countries. The reptile’s coat ranges from black to pale gray, while the underside can either be yellow or red. The snake has a distinctive black neck band which does not appear in some species. Others have coats ranging from yellow, red-brown, olive brown, to green. The species primarily feeds on rodents, amphibians, smaller snakes, and birds. It inhabits savannah and semi-arid areas. The snake has two large venom glands located on both sides of the head which eject venom when threatened. The species lays eggs and lives for an average of 20 years in the wild. The Common Agama is a lizard species which roams sub-Saharan Africa. The animal is sighted in rural areas as well as urban and suburban regions. The species prefers areas with sufficient food and vegetation cover. It feeds on insects, smaller reptiles, and sometimes vegetation. The species has a distinctive olive-colored head, supported by a well-defined neck. The dominant male is notable for its bright colors, an orange head, and a bright-blue body. The Ondo Forest Gecko is endemic to Nigeria. The species has only been recorded from the Idanre Hills located in Ondo State, southeast Nigeria. The species is mainly active during the day in regions with shades, and it feeds on insects as well as other smaller geckos. The animal lives under rocks and in rocky outcrops. The rest of Nigeria’s reptiles are puff adder (Bitis arietans); Guenther’s saw-Tailed lizards (Holaspis guentheri); Bosc’s fringe-toed lizard (Acanthodactylus boskianus); Dunger’s file snake (Gonionotophis egbensis); giant forest gecko (Cnemaspis gigas) and West African worm lizard (Baikia africana). The reptiles of Nigeria have been adversely affected by environmental degradation in Nigeria including deforestation, clearance of habitats for agriculture, urban development, and human conflict.